Lenk – simple luxury with health benefits! A spa&ski resort Lenk is cozily located just in 150km from Geneve. Quite often in guidebooks you can see other name of this little village – Simmental. Amazing beauty of mountains, endless forests, pine fragrance in the air are waiting for the tourists. The pride of Lenk is the top quality of service and the best technical snowparks’ equipment. In addition Lenk is famous for its medical factors. There are 2 thermal sulfur springs nearby. Sulfur water bathes are used for skin and other kind of diseases treatment. We’d like to offer you to get acquainted with one of Swiss resorts, where you can combine the useful with the pleasant – to do active sports and to improve your health at the same time! We asked some questions to Sonja Teuscher – a worker of Marketing and Produkt management department in Lenk-Simmental Tourismus AG. SkiT. : Most of our tourists when choosing a holiday destination pay attention to its location and accessibility. Could you tell us about Lenk location and its unique nature peculiarities? 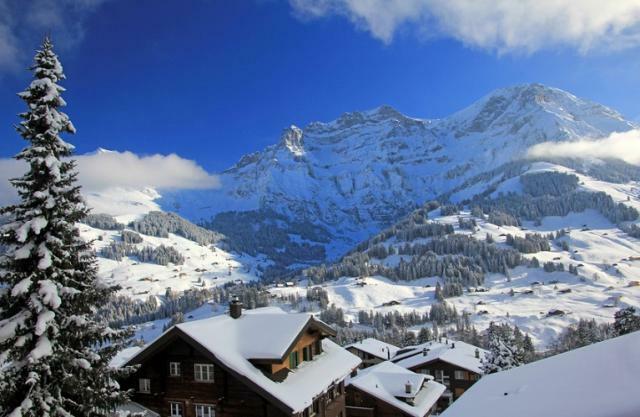 ST.: Our ski resort is well known in Switzerland and even in some neighboring countries. It is located in the Bernese Oberland and it is easily accessible by train or public transport. From our capital Berne it only takes about an hour and fifteen minutes to reach the bottom station. Right next to the station there are free parking spots available, what makes it even more convenient. There is a train, which takes our guests from Berne to Lenk with only one switch of train. Once you have reached the train station there are shuttle buses on site, which bring you straight to the cable railway. Lenk is said to be the most beautiful valley head of the entire Bernese Oberland. The mountains which surround the town and the ski resort are breathtaking. As soon as the first snow falls, Lenk turns into a winter wonderland. SkiT. : When did Lenk tourism start to develop? ST.: Long before the first spa visitors came to the Simmental (Simme Valley), the Stone Age hunters had gathered there. Neighbours from Valais sought their fortune here too. The thermal water in Weissenburg became popular in 1604. From 1686, high society started staying in Lenk for curative treatments. Around 1900, there were 250 guest beds, mainly for summer tourism. Soon the first winter sports guests arrived. Also on the Lenk the English played a decisive role in the development of foreign tourism. They also were responsible for helping the Lenk region make the break through and they initiated the construction of the first transport system – the famous «Funis». Amongst the numerous guests also Field marshal Viscount Montgomery of Alamein, the commander in chief of the allied land forces in the 2nd World War spent many winter holidays on the Lenk. SkiT. : What do «7 springs of Simme» mean? ST.: «D’Sibe Brünne» – the seven springs of the River Simme, which gives the valley its name, is situated on the Rezliberg above Lenk, right at the foot of a mighty limestone wall. The Simme erupts here into a mass of white foam. In summer, up to 2,800 litres flow via the seven springs every second. The «Siebe Brünne», a magical waterfall, is a renowned source of power and a wonderful place to spend some time. SkiT. : Lenk is amongst special Swiss ski resorts together with Skuol, Leukerbad, Arosa, Bad Ragaz. All these resorts afford ground not only for skiing, but also for health care. How can you describe a uniqueness of Lenk treatment and rehabilitation practices? What health problems can be solved at your resort? ST.: Up above the Weissenburg a warm spring issues from a rocky crevice. For more than 350 remarkable years, the Bath Weissenburg has been a renowned health spa. In 1604 the city council of Berne paid to have the spring encased in stone, had a bathing pool built and employed a pool attendant. In order to be able to cope with the crowds of people seeking cures, the front bathing and spa building was constructed in 1875. Bath Weissenburg had at this time up to 300 beds and became the meeting place of the European high nobility. When in 1938 the Dutch Queen Wilhelmine was spending time there for a cure with her daughter and Princess Juliana became engaged during the stay to Prince Bernhard, guests flocked from all over the world. There is a Lenkerhof Gourmet Spa Resort hotel in Lenk. This hotel offers outdoor suphur pool dating back almost 350 years. Hydro massage jets gently massage your back in the 34°C water. Bathing in this water is very good for skin and helps to alleviate skin conditions, rheumatism and joint pain. I also stimulates the metabolism and helps body to detoxify. SkiT. : What can you tell about slopes and skiing features? What other ski resorts do Lenk border on? ST.: The Simmental offers with its five ski resorts a unique variety. Excellent ski slopes, top modern lifts but also some secret spots await you. In our main ski resort Adelboden-Lenk everyone will find their perfect slope. A wide range of rails and obstacles await freestyle skiers and snowboarders in the Gran Masta Park (GMP) on the Hahnenmoos, downhill skiers can carve their way across the wide slopes on the Metsch, and beginners can practice their turns on the flatter Bühlberg slopes. The Betelberg ski resort, which is located on the other side of town, is well equipped with snow cannons and offers a family-friendly destination which is well known for its wide slopes – just perfect for first-timers. Children can spend the whole day in the Kids Village at the Stoss midway station, being entertained and looked after for just CHF 5 an hour. The permanent snowcross track on the Hasler is guaranteed to get everyone’s pulse racing, while cosy alpine bars invite you to simply while away the hours. SkiT. : As far as we know, Lenk is at an altitude of just 1068 m. Does this fact impact on ski season length? Howlongdoesaskiseasonlast? ST.: It is true, that the town Lenk is not very high up. The ski resort starts on an altitude of 1068 m and reaches to 2200 m.Our season lasts from end of Novemver/mid-December till the mid-April. SkiT. : Your resort is year-round, so you receive your guests in winter as well as in summer. What can you tell about summer activities? What can youth and senior people be engaged at? ST.: When the snow gives way to the lush alpine meadows, the Simmental turns into a mellow hiker’s paradise, with over 600km of sign-posted hiking trails. Whether on easy walks, on challenging mountain tours or on numerous bike trails, past glaciers, crystal-clear mountain lakes, wild streams or impressive waterfalls, you will enjoy a marvelous panoramic view onto uncountable mountain peaks. For our guests looking for a particular nature experience, we have just the right answer with our thematic trails. SkiT. : We know that Lenk is one of Swiss resorts which has «Families Welcome» quality label. Could you share a secret, in what way do you organize work with families, what programs, activities «force» parents and their children to strain after you all year round? ST.: Children are especially welcome in Lenk! Family friendliness is a point of pride all over the valley. The holiday resort of Lenk imSimmental, awarded the «Families welcome» seal of quality, orients its offers towards this target group in particular. Attractive and varied children’s programs will delight our family guests. Activities range from pizza making, pirate camps, go-kart construction, weaving, ceramic painting, adventure days in our rope park and many more. Furthermore in Lenk-Simmental, mountain railways are already included with one overnight stay at a hotel. SkiT. : Are there off-piste runs and facilities for snowboarders and freeriders? Where can they relax and have a talk after a busy day? ST.: Snowboarders and free riders feel most comfortable in the Gran Masta Park. The three lines offer everyone – from beginner to professional – the right challenge. More than 30 kickers, rails and obstacles invite you to snowboard and free-ski. The Gran Masta Park is thus one of the largest snow parks in Switzerland. Locals and experts know many secret rides though and the ski resort provides the possibility for ski and snowboard touring. After an eventful day of skiing across 210-km of perfectly-prepared pistes and as the sun is setting, Après ski begins to beckon. Cozy lodges, snow bars, pubs and the legendary tepee offer a rustic end to your day. SkiT. : Are there ski schools in Lenk? What skills and tendencies can they teach children and adults? ST.: There are three different ski and cross-country schools in Lenk, which have the perfect offer for the whole family, for snowboard fanatics, thrill-seekers, and everyone else! There is not a single skill neither of them would be able to teach. From group lessons in basic skiing for little children till private lessons in biathlon is everything covered. SkiT. : Judging from the fact that Lenk holds festivals and other crowded events with no troubles, you don’t have difficulties with accommodation facilities. Do your guests prefer staying at hotels, residences or chalets? ST.: There are very few complaints due to noise pollution and if there is any kind of event, which might get a little louder than usually, we warn our guests beforehand. Otherwise we don’t have any difficulties. You can’t really say whether our guests prefer to stay in hotels, residences or chalets. We do have many second home owners and we host a lot of guests in holiday rentals and chalets, but there are also great hotels, which are popular. SkiT. : Can you name the most popular ones? ST.: The most popular hotel and well known hotel is the Lenkerhof gourmet spa resort, which attracts mainly the upper class. It is a five start hotel and offers superior quality, a large spectrum of choices in the wellness area, different rooms and an absolute gourmet gastronomy. SkiT. : Lenk is famous for Lenk Jazz. We suppose, the resort looks beyond the only one Jazz festival. WhatotherinterestingeventsareheldinLenk? ST.: Our events are very diverse. One major topic is the alpine culture. In autumn the cows descend from their pastures and the traditional Alpine Festival takes place – the cultural highlight of the year. In various workshops guests can get introduced by professionals to the art of yodeling, playing the alphorn, producing cheese, as well as the traditional Swiss sports of wrestling and hornussen. Besides that and many more there is a sledge dog and a night race in the winter as well as a gospel and jazz workshops in the summer. SkiT. : Do you have any special offers for ski pass buying for different categories of tourists? ST.: Starting in winter 16/17 our guests receive more for their money. Included in the winter-special is an overnight stay with breakfast and your personal day pass for the ski area Adelboden-Lenk – and this for an unbeatable price. There are special offers for families. SkiT. : What countries do your tourists usually come from? What is the fastest way of getting to Lenk from main airports and railway stations? ST.: Most of our tourists are from Switzerland. Especially during the winter we host a lot of daily guests, but of course some tourists from further away as well. The Simmental is only a few hours away from the Zürich, Basel, or Geneva international airports, and a flight that takes you directly to Bern-Belp is practically in the Bernese Oberland already. Once in Belp, it’s a 1-hr drive or a relaxing 1 hr 45min by train. Traveling on the A6 motorway Bern-Thun, take the Wimmis/Zweisimmen exit through the Simmenfluh Tunnel, on the other side of which begins your journey up the Simme River Valley. The main road in the valley, the Simmentalstrasse, is open year-round. Coming from Bulle and the Canton of Freiburg, one can reach Lenk via Charmey by traveling over the Jaunpass into the Simmental (Boltigen) or by traveling via Château d’Oex-Saanen-Zweisimmen.